I like to play with beads. 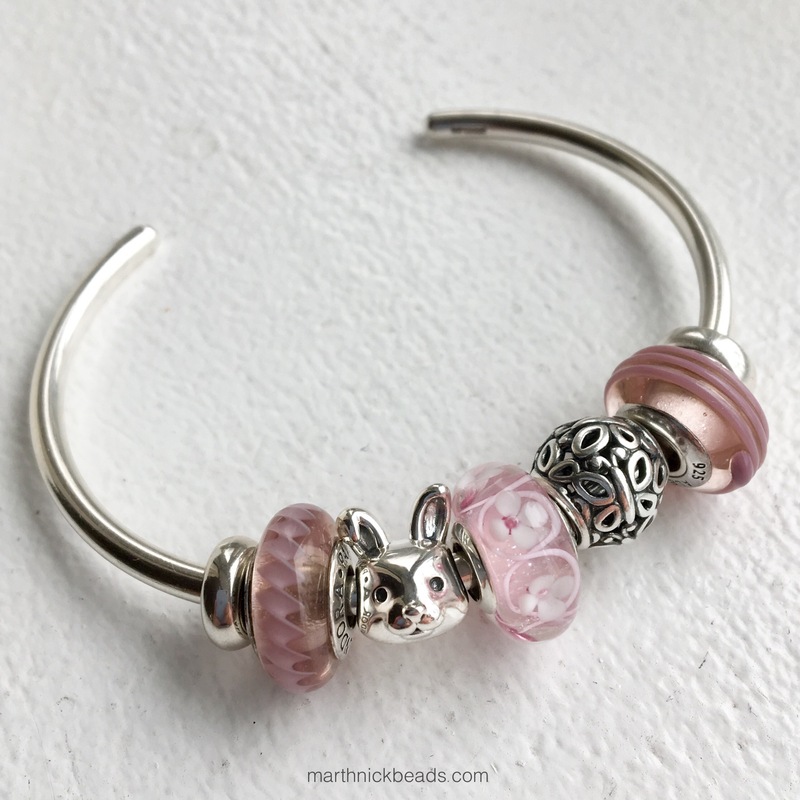 Just a quick blog post for today to share photos of the pink Field of Flowers Pandora Murano and the adorable Sweet Daisies ring that I bought yesterday. The manager at my local store is a real sweetheart and always lets me know when their new stock is out. I believe the collection is out March 16, according to Mora Pandora, which is where I first saw the ring. I love simple rings and this one is great for stacking. The ring is super shiny and almost sparkly without having CZ. Perfect! I think it was $55 CAN, so it will be less than that in US dollars. I don’t have enough Pandora beads to put together a full combo, really, so I took my handy dandy Trollbeads Bangle and made up some combos using beads from other brands. Because I don’t buy a lot of Pandora, what I do buy needs to fit in with my other beads. I’m not going to list every bead, since there are so many combos here, but do ask if you want to know what anything is! Let’s start with Ohm Beads. This has sort of a dreamy feel, I think, with the Cold Milk and Purple Haze Beads. With True Beadz, the Baby Pink beads are a great match. I love it with the Trollbeads Pearls. 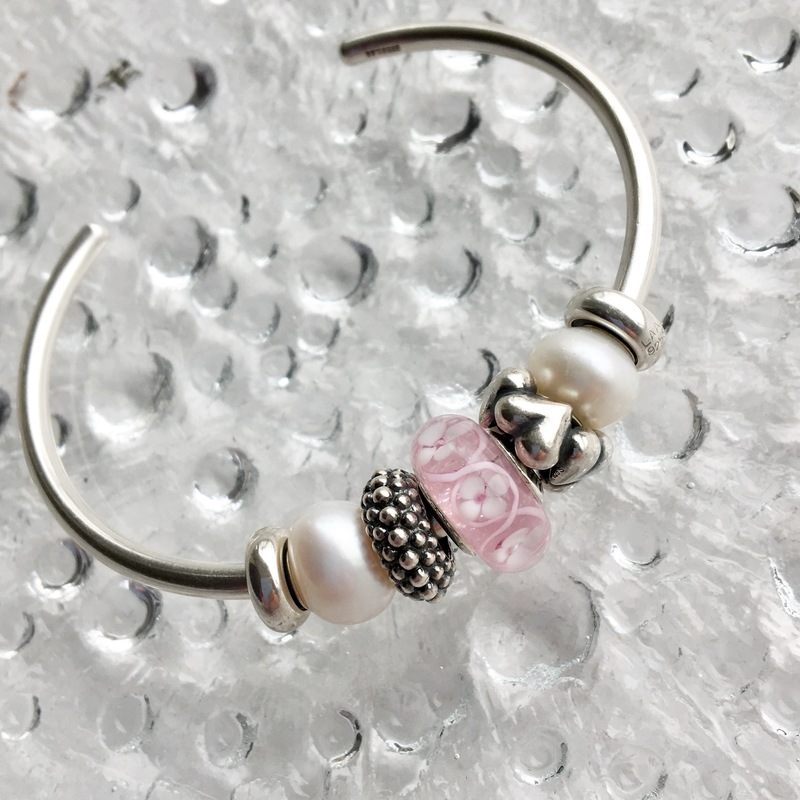 Here’s a cute bangle for Easter with Pandora beads! Lastly, here’s a full bracelet using Redbalifrog silver, some True Beadz and Trollbeads. Be sure to zoom in on the adorable Owl Nest! Ok, any votes for a favourite look? I actually kind of like the Ohm Beads one best, even though it’s a bit of an unexpected pairing. I would be happy to wear any of these, really. I chose the pink over the purple Field of Flowers, which I wasn’t expecting to do. With purple being my favourite colour it would have been the obvious choice, but I really did like how this was such a delicate pink. I must admit that this bead really gave me trouble with getting decent photos. It looks much better in person than it does here, whereas most of the time I feel that I can capture the beauty of a bead. This one is very complex and pale and I bet it will be very popular. Coming up tomorrow are piles of True Beadz photos. Oh my goodness, Julia and Alexey have really outdone themselves with the St. Patrick collection. My O’Sheep arrived only slightly tipsy! They all look great! My favorite look is the True Beadz silver flowers + Baby Pink beads bangle. The TrueBeadz colors are a perfect frame for the ornate Field of Flowers and the TrueBeadz flowers add texture to the otherwise smooth look. I so agree with you April. The Field of Flowers is such a busy bead that I think it will actually be a bit tricky to use. I will be interested to see what people on Instagram do with it. Really, just that on a leather bracelet would be quite nice. You’re 100% on the money. Busy beads are such divas. More often than not, they don’t play nicely with others. Sarah, I agree with you regarding the Pandora bead bangle! I like how it looks with the sweet bunny. I have a silver RBF Easter Egg bead that I could use with it also. Will look for your pictures later! I really loe your Pandora choices ! I had not noticed the ring and it is lovely. I love the bangle combination with the pearls -its simply beautiful! Hi Martha, I choose all of them! If I had to pick only one , it would be the True Beadz because roses and lilacs are two of my favorite flowers. I’m especially surprised that I like the ring as much as I do because I don’t usually wear one. Hi Suzanne, I think the ring is a great one for people who don’t usually wear them! It’s so slender that I hardly feel it on, yet it’s very pretty. The True Beadz silver flowers are truly gorgeous, aren’t they? This murano is soo pretty, props to Pandora for up-ing their game with the fancy more unique style glass. I would have picked purple over pink as I prefer the color in general but either way these beads are great!! There is a blue version too!!! Hands down looks best with all of Julia’s soft pretty colors. Hi Alex! Is it that red fish scales glass bead you’re excited about? It would be awesome with some silver fish beads! Yep that’s the one! It prob would look so good with some fish and blue glass or for some reason I wanna try pairing up this red bead with ohms fireball, they might compliment each other ! Ooo, that might look really cool! Thanks so much Audrey! I do have a lot of fun putting combos together. 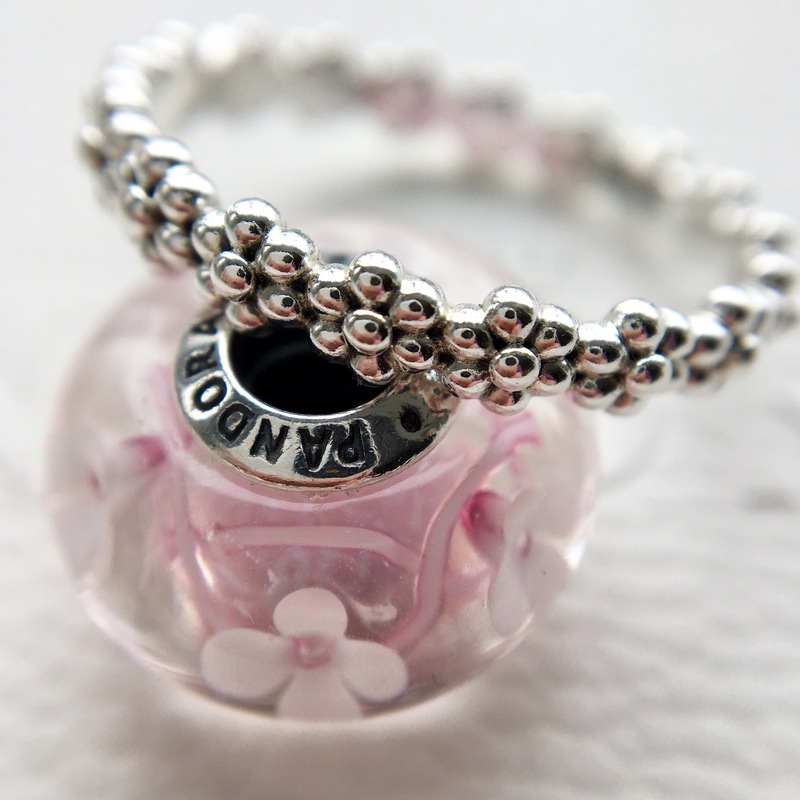 I love the bunny bead too as it has such a sweet little smile. The owl nest is so darling! 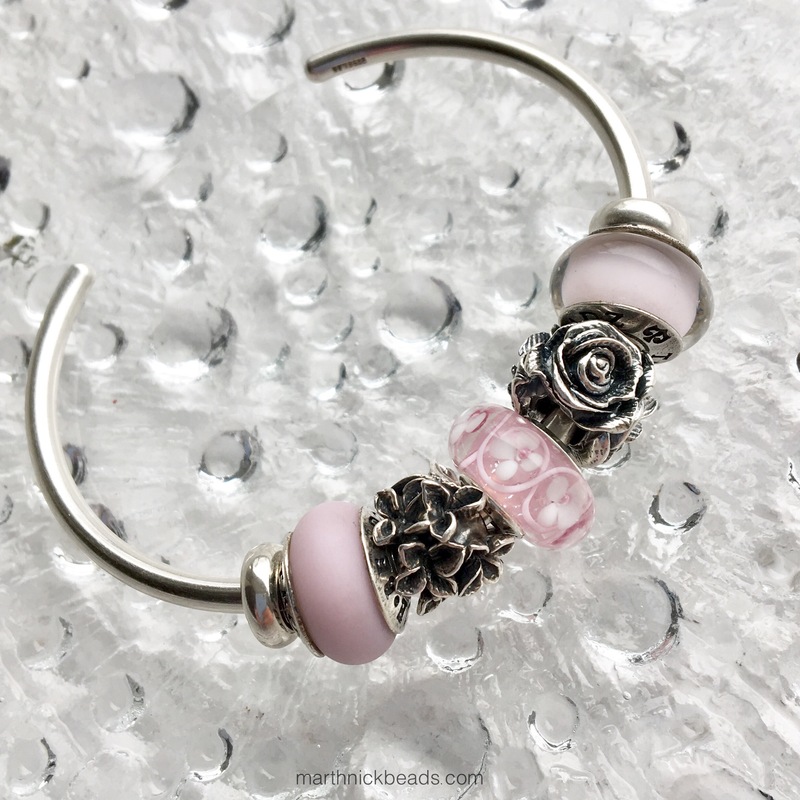 I can tell everyone right now that my bead budget is going to be blown sky high with the Pandora Spring and Summer releases! I checked Mora Pandora’s previews and have several items on my Have to Have list. Love the Field of Flowers murano in pink and there is also a lilac (need both!). 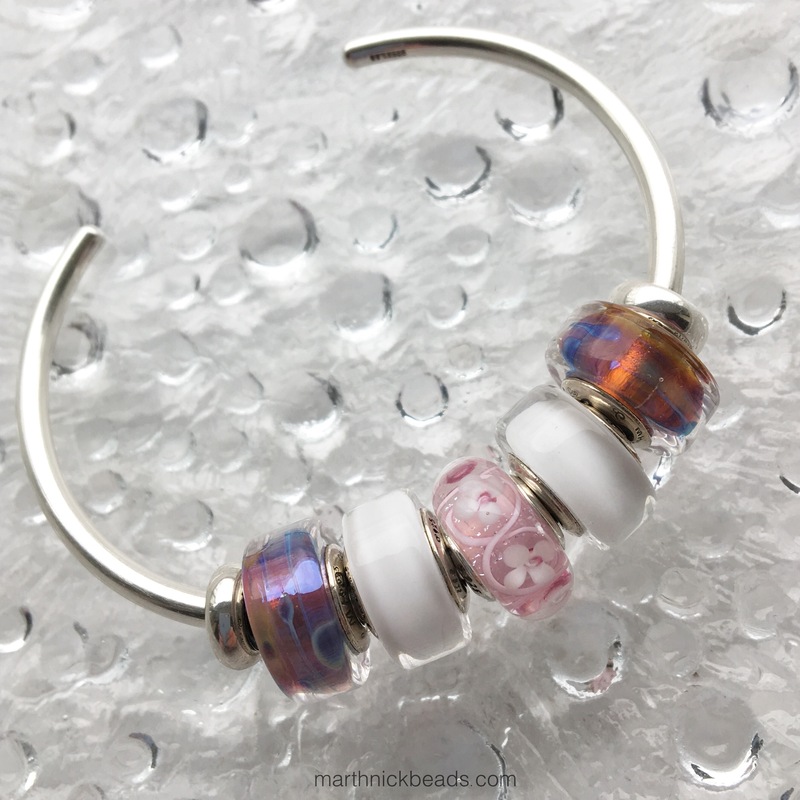 Martha, I love your designs with Pandora, True Beadz, and the Trollbeads pearls. 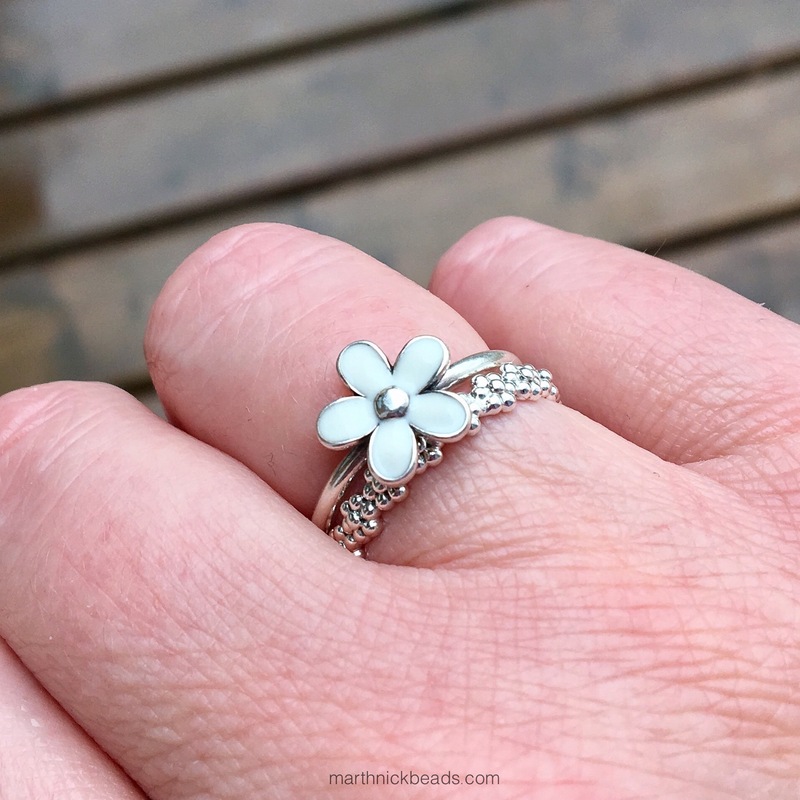 Like you, I love small stackables like the Sweet Daisies ring. 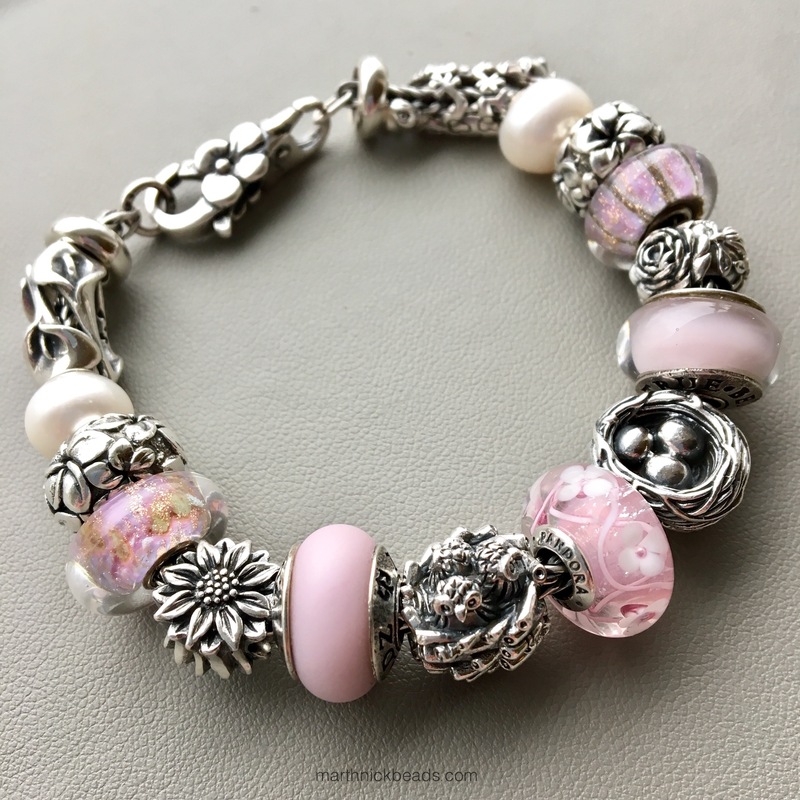 Also on my list are several items in the Magnolia collection, the floral enamel Essence charms, Pink Glitter murano, and the Woven Mixed Pink (two toned) leather bracelet. I could go on all day! Great stuff! Can’t wait! Dawn, I forgot about the Magnolia Blooms enamels! I saw them in the store and quite liked the dangle and the clips. Also, the Piglet dangle is super cute! I’m looking forward to the two toned leather bracelets also. I just added that up in my head and about fainted, ha ha! You are so lucky to have seen and purchased your items early! I think we’re all in the same boat loving these new collections. I took a look at Piglet and you’re right, he is really cute! You have a lot of neat characters and critters in your collection. I also love your full bracelet design with the floral and nature themed beads. If the Field of Flowers looks even better than your very good photos it must be phenomenal! Can’t wait to see all of these new and fun pieces and so glad Pandora is having their free bracelet promo shortly after the Spring release! Hi again Martha, I just took a look on Mora Pandora and I am loving the lilac version too. I need a calculator to add up everything I want with all the wonderful beads coming out now! Hi Suzanne! The lilac version is so pretty and I had a plan to buy it but the night before I went I saw the ring on Mora Pandora, so made that a priority. There are just too many wonderful beads! Hi Carol! The nice thing about the Remarkable Rabbit is that it’s quite a bit cheaper than most Pandora beads. I love how shiny it is! I like it with Trollbead pearl on bangle, simple & elegant. I agree, Michele and will probably wear it without the spacers-just the glass bead and two pearls. Will try it out, anyway. I just love whatever that light pink TrueBeadz you used in your combination bracelet! What color family is it? That’s the Baby Pink colour. I find that colour goes with a lot of Pandora beads, actually! Good for the USA, Canada and Australia only. Does not include the two most recent collections.